Home Better Business Bureau Is The Better Business Bureau’s Credibility Still At Stake? After the Better Business Bureau’s over 100 year history of helping consumers there credibility was called into question in 2010 when ABC 20/20 broke a story of a pay to play scheme in which A plus ratings are awarded to those who pay membership fees, and F ratings were used to punish those who don’t. It is important to know the Better Business Bureau is not a government agency and has no enforcement powers. Despite that, often the BBB is labeled as a consumer watchdog organization but the truth is the BBB is not. The term accredited may be confusing to consumers. A business can only be called accredited if it pays a fee. The fees start at around $300.00 annually and go up from there. An accredited business must meet the standards set by the Better Business Bureau. It is also good to know the local BBB’s are funded primarily by the accreditation fees. In the 2010 ABC 20/20 news report a group of business owners paid the membership fee of $425.00 to the Better Business Bureau for a made up company called Hamas, named after a Middle Eastern terror group. Because of the payment of $425.00 for the BBB membership Hamas was given an A minus rating. At the time, Robert Blumenthal was the Attorney General of Connecticut and stated “Right now, this rating system is really unworthy of consumer trust or confidence.” In a demand letter to the BBB, Robert Blumenthal who is no longer the Attorney General, but is now a U. S. Senator wrote; “potentially harmful and misleading to consumers” and asked them to no longer use the current grading system. It seems mistakes were happening more than once. An anonymous blogger reported the BBB awarded him an A minus rating to a made up sushi restaurant and an A plus to a made up company called Stormfront that is a neo-Nazi web site. In the 20/20 ABC story there were other instances where other company owners paid the membership fee and the grade was raised above a B plus. Many people may be asking the question today, has the Better Business Bureau changed much since the 2010 news story? The National Investigative Report tried to get the BBB to answer questions but they refused. NIR looked over hundreds of profiles on the BBB web site and found all the companies who paid a membership fee had an A, A plus or A minus rating. Only a few had less than 100 complaints. But a few companies had more than a hundred complaints. Liberty Mutual Group had 1321 complaints over a three year period and Travelocity had 1556 complaints and has an A plus rating. The Sparks Network Inc. had 118 complaints and has an A plus rating. But after checking the profile again, they are no longer a member and have No Rating. It seems, if you pay for a membership you will get an A or better rating. Has the BBB changed since the 2010 news report? It seems not. Wolfgang Puck, who is not an accredited member, has no rating with 5 complaints but in 2010 he had an F rating. The Ritz Carlton, Boston Common, also not an accredited member, has an A plus rating with no complaints, but in 2010 they had an F with two complaints. 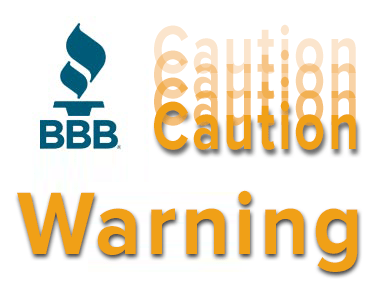 There are a few red flags on the BBB’s web site where companies have alerts but still have a B or above rating. Bar Education Inc. is noted to have government action but still has a B rating. National College of KY Inc. is noted to have court actions brought by the Attorney General of Kentucky, but still has a B rating. News Media Publishing is noted that mail was returned but still has an A plus rating. Specifically, the BBB asked the company to remove erroneous claims made against the BBB and its dispute resolution process. To date, the company has not complied with our request. JACI Group states they are in compliance with FTC guidelines for endorsements. The BBB asked the company to provide contact information for the individuals quoted on their website. To date, the company has not responded to our request. The BBB also requested some sort of statistical evidence supporting their claim of effectively resolving disputes. To date, the company has not complied with our request. The BBB considers PeopleClaim.com to be a competitor and has denied PeopleClaim.com a BBB accreditation on that basis. Jaci Group Inc. says they discontinued there BBB membership because of the Better Business Bureau’s bad practices. Shortly thereafter the BBB lowered Jaci Group Inc.’s rating to an F. Jaci Group Inc. is puzzled by this action because there customer satisfaction history by the BBB’s own records. The BBB’s latest action was to try to coerce PeopleClaim.com to reveal confidential trade secrets, grant unrestricted access to PeopleClaim.com’s clients, and alter information posted about the Better Business Bureau. PeopleClaim.com says given the history of mismanagement of conflicts of interest PeopleClaim.com is justifiably reluctant to provide such information. This would further call to question the credibility of the Better Business Bureau. National Investigative Report feels the BBB has changed little since the 2010 news report. NIR had hoped for the BBB to respond to the many questions NIR has for them but the BBB was advised by its attorney not to. NIR hopes the BBB will change its mind and provide information and respond to the news report. Do you think the BBB is creditable? Would you still use the BBB after seeing the 2010 news story? National Investigative Report will keep a close eye on the Better Business Bureau and bring updates as they develop. National Investigative Report would like to know what you think about this news report. Very Interesting. I never knew these facts. I’ve been saying this forever! UGH! The BBB seems like such a rip off, I have no idea how they got the credibility that they have. I wish the government would have something similar, because I do think consumer protection is important, but having a company that makes money off forcing businesses to become accredited is not helping. I think it exploits businesses and consumers, especially small businesses. I agree with the both of you, the BBB can be very misleading and can obviously show favor to certain company if they wish with little to no blow back, they can just say they were following the rules and we did not know about that. Money talks! I never knew some of the facts that this article brings up and didn’t watch the 20/20 episode but have always been skeptical of the BBB and have never relied on them as a reliable source. I believe the only real way to know a good business is to get referrals. Also, its good to keep in mind that no business is perfect- businesses like people are not going to please everyone. When I called the BBB they were no help to me. They sided with the company not me as a consumer. Wow! I honestly did not realize this was an issue for businesses. When I hear about the BBB, I think of credibility right away. After reading the post here, I am not so sure I would trust them again. They almost seem like any other corp. that is just in it for the money. If for any reason, a private organization that servers the right of the masses is suddenly seen to be outgrowing its roles to be a kind of a an un-official government organization, its surely due to the absence of checks and balances that should have been put in place by the government over them . But since this error has been spotted, I believe the government knows how to better handle the situation. Its however unfortunate that many citizens have lost vote of confidence on the company via the survey conducted. Really good article. the BBB can be very misleading .. I believe the only real way to know a good business is to get referrals. I honestly did not realize this was an issue for businesses. When I hear about the BBB, I think of credibility right away. This article really turn my thoughts about the BBB to a negative ! It is always good to have these points reaffirmed by others with the same experience. Excellent points. Congress needs to do a over sight hearing about the Better Business Bureau. This company is hurting small Business owners. BBB has been good in past but they have some issues. I have noticed that when you complain about a company who have paid to be a member then they almost always side with the company or say they can do anything else. The BBB is a joke.